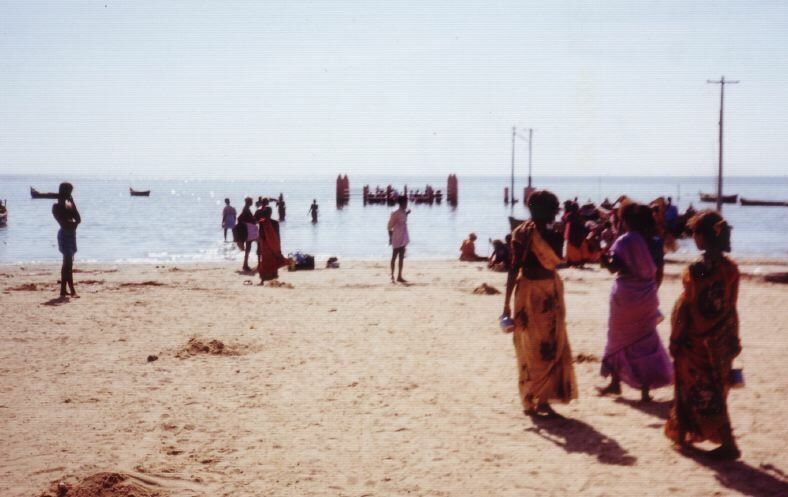 Three of the shrines on the Sethu coast (south eastern coast) of Tamilnadu associated with legends from the Ramayana are Rameswaram, Devipatnam and Tiruppullaani. The coastal town of Devipatnam is also known as Navapaashaanam. Legend has it that Rama worshipped Shiva (Tilakeswarar) on his way to battle the demon king Ravana. He is also said to have worshipped Ganesha, Parvati, Aadi Jagannatha Perumaal and installed nine stones representing the Navagrahas or the nine celestial bodies. Hence the name Navapaashaanam. Legend also has it that the name Devipatnam arose from the belief that Devi (Parvati) founded this site to commemorate her destruction of the demon Mahisasuran. There are shrines to Tilakeswarar, Lokanayaki and Kadaladaitta Perumaal and processional images of Rama with Sita, Lakshmana and Hanuman. (Image above courtesy C. Vedanarayanan UK).